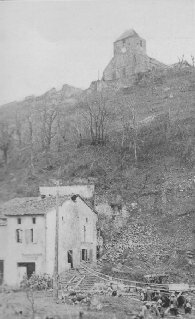 Hill which was strongly defended by the Germans. 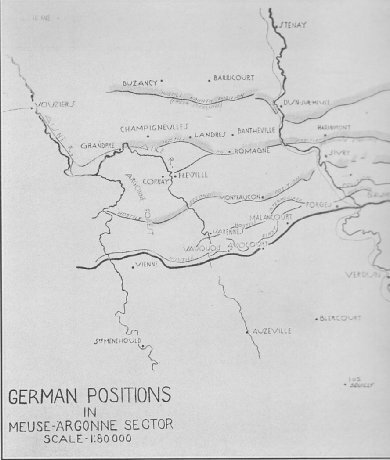 German positions in Meuse-Argonne Sector, prepared by Chief of Staff, First Army. How anyone could have lived through that barrage, God alone knows. But many did. Out of their dugouts they cameto fight as German veterans fightalways doing the unusuallurking behind a bushhidden in an old stumpalways somewhere unexpected. Every foot of ground was disputed and yielded only for a terrific price. They met steel with steelfire with fire. It was eye for eye, and life for life. For forty-seven days the battle raged, unabated. 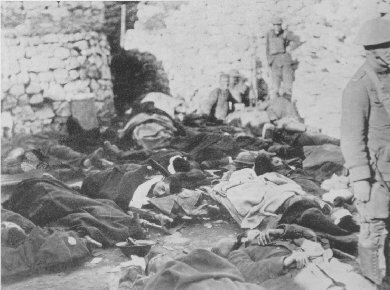 Boys reached the pinnacles of gloryboys went screaming into eternityboys died like men. Twenty-nine combat divisions did the bulk of the fighting. One million two hundred thousand American troops participated. One hundred twenty thousand casualties was America's sacrifice. Such was te Argonne.